Yes, necessity is the mother of invention. Which is how I came to make this risotto pie. Just what exactly was in the fridge? Some left over risotto (not enough for three though) a pack of all butter puff pastry and sitting on top of the fridge, some eggs, and as always, some cheese. So I rolled out the pastry, mixed the risotto with two beaten eggs, reserving a little to glaze the pastry. 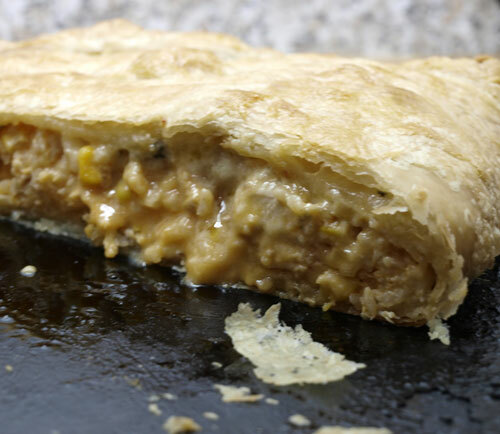 The risotto and egg mix went into the pastry and was sprinkled with some crumbled Texford and Tebbit blue cheese, the pastry was folded over this mix, washed with the remaining egg and baked in the oven until puffed and golden. Quite, quite delicious and not something I would ever have considered if it were not that these ingredients were left over in the fridge! Oh dear God.....I can imagine the total, utter blissfulness of this. What have you done? People will be cooking risotto just to make this! You're brilliant! This is a heart attack on a plate and I LOVE IT!!! You need to spread the word about this awesome and unique dish!! It sounds very good indeed. Just received my Riverford Diary - it's great. Thank you very much. 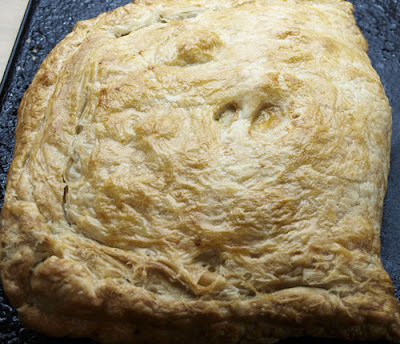 Oh my... this is comfort food at it's best - cheese, risotto AND puff pastry?!! Yum!!! I've never thought to try this. It looks creamy and delicious!